Anna-Christina is back this month at Kentish Town Library for a children's Story Time Christmas Special on Wednesday 20th December. Details of the event can be found via the link below. Read a monthly news round-up by Anna-Christina in her latest Blog post below. It includes her Story Time session at Kentish Town Library, the Baby & Children's Market UK, her rock band's album reissue, The Business Show 2017 and a link to the first review of Nature's Rainbow album. 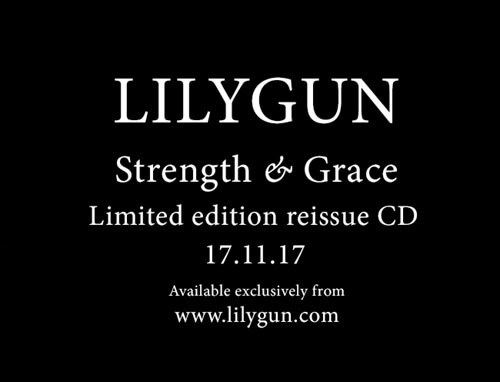 "I'm so thrilled to announce that today, my band's second album Strength & Grace has been reissued! 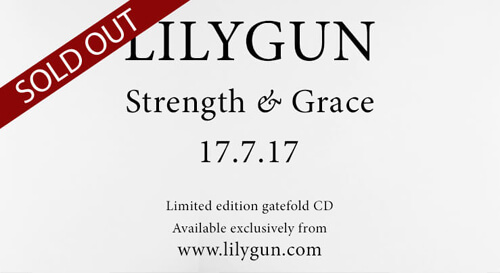 When Strength & Grace came out back in July, it sold out in 6 days! We decided to reissue the album as there were so many people who didn't get a copy and it's not available as a digital download. To avoid disappointment make sure you get your copy from www.lilygun.com now because it may well sell out again! 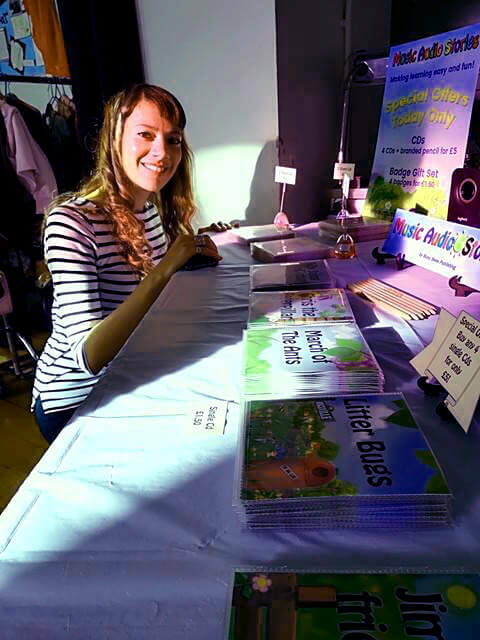 ♥Anna-Christina"
"Here I am at the Baby & Children's Market UK selling my products. Sometimes I can't believe I do things like this! As an entrepreneur, you must adopt a certain mindset, the "can do" mindset. You must learn to run a business and be business-minded and I can tell you, most creative people find this hard. It takes brain training :-D you must learn how to do the hard sell! 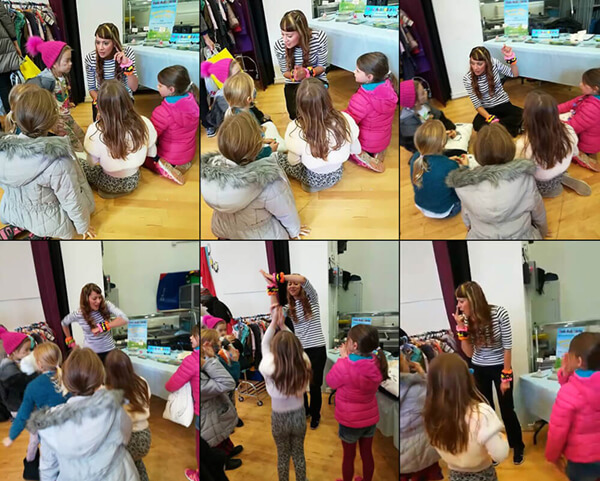 Both parents and children loved my stories and my company made a profit! I surprise and impress myself all the time! This helps me to keep going... Keep going on days when I don't have a Boss to tell me what move to make next or what to do now. I feel so grateful to be on this wonderfully unpredictable, magical journey with Music Audio Stories ♥Anna-Christina"
Details regarding Music Audio Stories at the Baby & Children's Market UK have been posted. Anna-Christina will be doing part of her Story Time with the children at the event as well as selling Music Audio Stories latest and new products. Read about it below. Anna-Christina has begun a new project with Adie Hardy and Founder/Head Trainer at Design Your Ship, Andreea Vasile. Nature's Rainbow, the meditation album Anna-Christina composed the music for together with Adie Hardy, has received a fantastic album review from Rocking Ur Teens. Anna-Christina has been invited to visit Kentish Town Library with her Story Time for the children during the next Half Term Holiday. Details of the session have been posted in her Blog. Anna-Christina has also been invited back to The Baby & Children's Market next month. Not only will Music Audio Stories have a stall at the market, they will also be providing the entertainment for the children on the day. Details about this event coming soon. 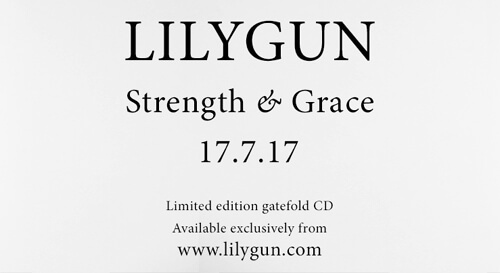 Today Anna-Christina's band Lilygun release their second single from their second album Strength & Grace! Download the new song What Goes Around from Bandcamp below. The single is also hitting the radio airwaves in Holland throughout this month. Read about that in her latest Blog post also below. If you missed Anna-Christina's live performance and interview on K2K Radio last week, a link to the podcast of the show has been posted on Lilygun's website. More Lilygun action this week for Anna-Christina when the band filmed their second music video for the song What Goes Around. The original acoustic version of this song is currently up for grabs for free when you sign up on Lilygun's website here. Anna-Christina will be playing a special live acoustic set on Thursday 14th September at the K2K Radio studio and talking about Lilygun's new album Strength & Grace. Tune into K2K Radio 8-10pm to hear the live performance and interview. More details can be found below. Read the latest news about Anna-Christina's band Lilygun, plus find out how you can get your hands on a free song in her latest Blog post below. Since Music Audio Stories are currently working on their first book, Anna-Christina thought it would be a nice idea to tell you in her latest Blog post which books were her favourite when she was growing up! Anna-Christina and Adie Hardy recorded Invocation Blessings for Toks Beverley Coker - a Wisdom Life Coach, Transformational Mentor and Spiritual Soul Guide. Within 6 days of its release, the new Lilygun album has sold out! Anna-Christina shares how she feels about Lilygun in her latest Blog post below. Lilygun's New Album Out Now! Go to www.lilygun.com and there, you shall find, the wait for Lilygun's second album is over! Anna-Christina's band Lilygun, has released their first Music Video! Read all about it below. Anna-Christina and Dawattie Basdeo will be doing a live radio interview on K2K Radio Thursday 22nd June on The Nowness Show 3-5pm. Anna-Christina attended the Global Woman Club's Business Breakfast at the Savini at Criterion on Friday morning. Read about it in her latest Blog post below. Anna-Christina will be attending Business 2017 - Weekend MBA with Brian Tracy, Michelle Mone & Caprice. The UK's business event of the year at Hilton Metropole is a game-changing experience with top business leaders, creative thinkers, innovators, influencers, and legendary Brian Tracy in the rapidly changing British economic landscape – The Summit is designed to drive business growth, knowledge, connections and practical models by globally established practitioners in eight of the hottest expanding industries (Internet & Social Media, Sales & Investment, Property, Public Speaking, Forex, Marketing and others). 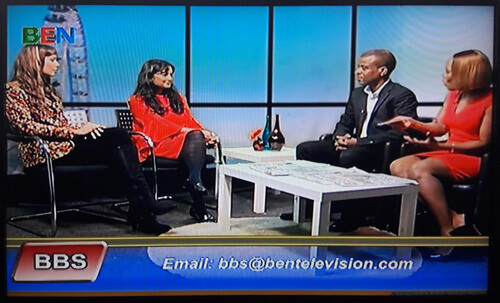 Anna-Christina with Dawattie Basdeo being interviewed on the Ben Breakfast Show on BEN TV Sky Channel 182. Anna-Christina with Dawattie Basdeo at BEN TV Studios this morning. 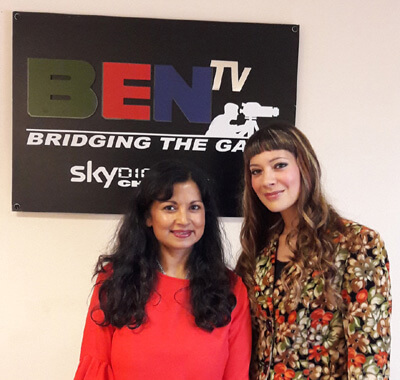 Anna-Christina's live TV interview with Dawattie Basdeo on BEN Television (Sky Channel 182) is tomorrow, Tuesday 6th June, at 10.30am. 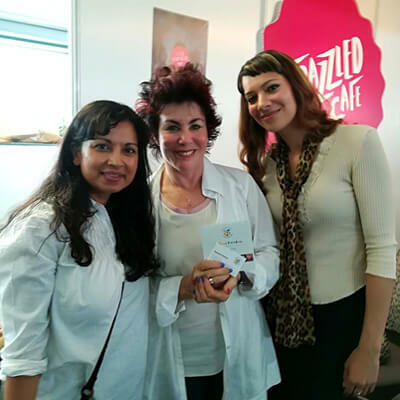 Anna-Christina, Dawattie Basdeo and Ruby Wax at the Mindful Living Show. Anna-Christina is at the Mindful Living Show held at the Business Design Centre today and Saturday 3rd June with Dawattie Basdeo. 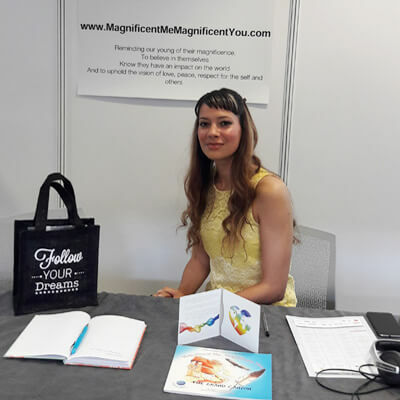 Magnificent Me Magnificent You will have a stand with CDs available of Nature’s Rainbow (Mindfulness Meditation for Teens) album and half hour workshop slots on both days. Anna-Christina will be at the Mindful Living Show next week Friday 2nd June and Saturday 3rd June with Dawattie Basdeo. Magnificent Me Magnificent You will have a stand with CDs available of Nature’s Rainbow (Mindfulness Meditation for Teens) album and half hour workshop slots on both days. Anna-Christina was on set filming Lilygun's first Music Video today! 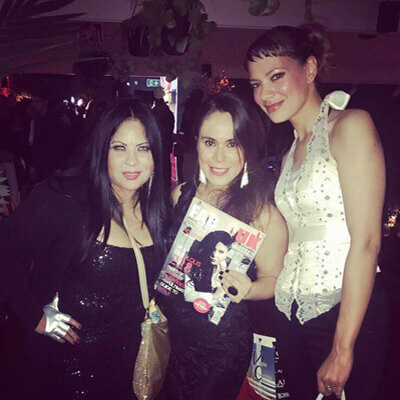 Anna-Christina with Rebeca Riofrio and Betty Fernanda Encinales Ortiz at FAB UK Magazine's 1st Anniversary party in London. Anna-Christina will be doing a live TV interview on BEN Television (Sky Channel 182) on Tuesday 30th May! To celebrate the release of Nature's Rainbow Mindfulness Meditation for Teens album, this month, I will be posting links to the downloads with a little insight into how Adie Hardy and I created the music in each track. I shall begin with the first track we made. NEW BLOG POST! What's it like narrating Music Audio Stories? Listen to the first track Red - Rose from Nature's Rainbow above. You can download it here Red - Rose. The music has been specially composed by Anna-Christina and Adie Hardy. Each track has its own flavour that complements and enhances the guided meditations written and performed by Dawattie Basdeo. Unlike other meditational music, the music has been created specifically for each colour of the rainbow, gliding between the ebb and flow of the words to aid the unique listening experience. The music is based upon the resonant note of the chakras and is designed to connect you with your inner peace. The album is now available to pre order. Anna-Christina's band is featured on radio in the UK, USA and Canada this month. Read about it in her latest Blog post below. Visit the Music page to hear a new sample of music composed by Anna-Christina and Adie Hardy. Today Anna-Christina is a Speaker on the panel at the Women Economic Forum in 2017! This month Anna-Christina's band is back on a couple of radio shows. In preparation for the release of their second album, Lilygun will be popping back up in the media again. Read about it in her latest Blog post below. 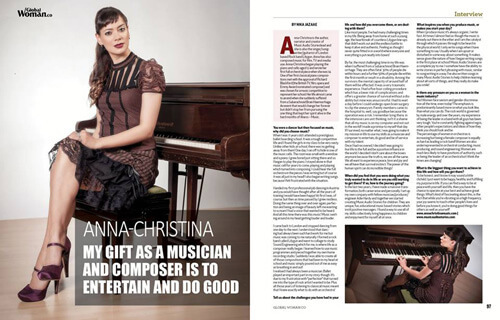 Read Anna-Christina's interview in Global Woman Magazine where she reveals why she chose music over ballet, her role models, the pressure of being a woman in the music industry and how she overcame illness. 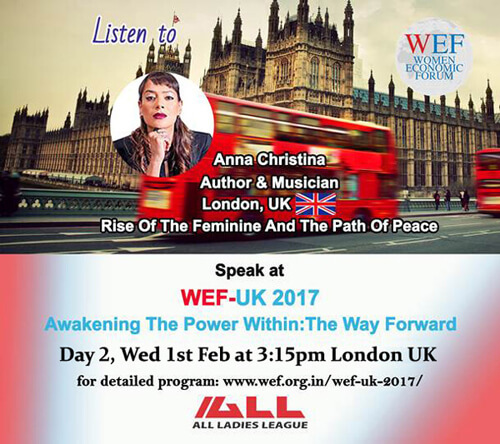 Anna-Christina has been invited to be a Speaker on a panel at the Women Economic Forum in 2017! Read about it in her latest Blog post below. 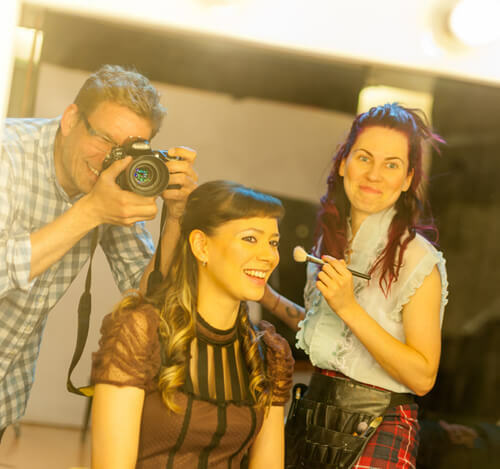 Anna-Christina was featured in the last issue of Fab UK Magazine! This classy fashion magazine brings you current, up-to-date fashions, alongside throw-back influences with a modern-day twist. It shares inspirational insight into the amazing lives and journeys of artists, entrepreneurs, photographers, musicians, designers; what drives them, how they attained their goals. The magazine is now available in a download PDF format. Download the magazine and read her interview below. This year is going to be a big year for Anna-Christina! Her second Lilygun album is due out along with a music video or two, Music Audio Stories are working on their first book with illustrator Jenika Ioffreda, her project with author Dawattie Basdeo (Nature’s Rainbow Mindfulness Meditation for Teens) is due for release in the next few months and we'll be seeing her speaking on a panel in a few weeks time at the Women Economic Forum 2017! Plus Anna-Christina has a few more projects and activities coming up. Watch this space!